A regular, common breeding resident and migrant, the Chestnut-sided Warbler was common during the Minnesota Breeding Bird Atlas (MNBBA). The Chestnut-sided Warbler is found throughout the upper midwestern and northeastern regions of the United States and Canada and south in the Appalachian Mountains to northern Georgia. The highest densities are found in northeastern Minnesota, northwestern Wisconsin, central Ontario, and Nova Scotia (Figure 1). Assigned a Continental Concern Score of 12/20 by Partners in Flight; identified as a Stewardship Species by Audubon Minnesota. Long-distance migrant that winters from southern Mexico to Panama. Insects, spiders, and other arthropods, gleaned from foliage. Cup nest, usually low or close to the ground in deciduous shrubs or saplings. Breeding distribution and relative abundance of the Chestnut-sided Warbler in North American based on the federal Breeding Bird Survey, 2011–2015 (Sauer et al. 2017). Green and Janssen (1975) reported that no nests of the species have been found from the Twin Cities metropolitan area southward since 1940, but isolated summer observations existed from Dakota, Rice, and Winona Counties in southeastern Minnesota. Besides the counties reported by Roberts, Green and Janssen added confirmed nesting in Anoka, Beltrami, Cook, Crow Wing, Hubbard, Lake, Stearns, and Wright Counties, plus inferred nesting from Wadena County. Janssen (1987) included confirmed nesting since 1970 in 9 counties, including Aitkin, Carlton, Cass, Clearwater, Cook, Crow Wing, Lake, Mille Lacs, and St. Louis. He highlighted summer observations from several counties in southern Minnesota, including Cottonwood, Dakota, Rice, and Winona. Janssen also suggested that nesting was again occurring in the Twin Cities area, because 15–20 individuals were observed in Scott County in June 1986. Later, Hertzel and Janssen (1998) reported confirmed nesting in Rice and Scott Counties in the southern metropolitan area. In addition, they confirmed nesting since 1970 in Anoka, Becker, and Roseau Counties. The Minnesota Biological Survey (MBS) recorded 1,290 breeding season locations and greatly expanded the Chestnut-sided Warbler’s reported contemporary breeding range in Minnesota (Minnesota Department of Natural Resources 2016). The MBS included breeding observation locations that straddled Carver/Scott and Redwood/Renville Counties in southern Minnesota and locations northwest to Clay, Kittson, Marshall, Otter Tail, Pennington, Red Lake, and Todd Counties. The MNBBA participants included 3,781 breeding records of the Chestnut-sided Warbler. The distribution of records further expanded the breeding range southward, with the most extreme being the possible nesting in Fillmore County and confirmed nesting in both Dakota and Goodhue Counties (Figure 2). This was the first nesting record for Dakota County and the first in Goodhue County since Roberts (1932) reported it in 1925 (Figure 2). Nesting was also confirmed for the first time in Kanabec, Koochiching, Lake of the Woods, Mahnomen, Morrison, Pine, Sherburne, and Wadena Counties. Probable nesting included Benton, Clay, Kittson, Marshall, Pennington, and Todd Counties. Nesting was confirmed for 2.2% (103/4,747) of all blocks and for 6.2% of blocks where the species was observed (103/1,666) (Figure 3; Table 1). Relative to other species of warblers, it was easier to observe nesting activity for the Chestnut-sided Warbler, but this species is more ubiquitous within the state. Green and Janssen (1975), Janssen (1987), and Hertzel and Janssen (1998) collectively provided evidence for the species’ recolonization into southern and western portions of the state since the early 1900s. However, observers need to be wary of identifications only by song because of confusion with the song of the Yellow Warbler, the similarity of which was also discussed by Roberts (1932). This is especially true in the western and southern areas of Minnesota, where the Yellow Warbler is more common. The decline of the Chestnut-sided Warbler’s range since the early 1900s has also been documented for Wisconsin, Illinois, and Missouri (Byers et al. 2013). They emphasized it had greatly benefitted and expanded its range due to logging activity and regeneration of second-growth forests that began in the early 1800s. As forests were later converted to agriculture and urban areas, the species’ range began to decline, as observed by Roberts in the early 1900s. In Minnesota, the species appears to be recolonizing areas formerly occupied in the west, southwest, and south, possibly because reforestation and protection efforts have increased. Small breeding populations much farther south and west still persist in the Ozark Plateau of Missouri and Arkansas, in eastern Iowa, and in north-central Colorado (Pfannmuller 2012). The Wisconsin breeding bird atlas confirmed nesting in several counties in its most southerly tier (Cutright et al. 2006). The species should be looked for in any suitable habitats in the southern and southwestern portions of Minnesota, but it should be confirmed by visual observation because of the similarity between its song and that of the Yellow Warbler. Breeding distribution of the Chestnut-sided Warbler in Minnesota based on the Breeding Bird Atlas (2009 – 2013). Summary statistics of observations by breeding status category for the Chestnut-sided Warbler in Minnesota based on all blocks (each 5 km x 5 km) surveyed during the Breeding Bird Atlas (2009-2013). Summary statistics for the Chestnut-sided Warbler observations by breeding status category for all blocks and priority blocks (each 5 km x 5 km) surveyed during the Minnesota Breeding Bird Atlas (2009-2013). The Chestnut-sided Warbler is highly associated with young upland forests, forest openings in deciduous and mixed deciduous-coniferous forests, and open habitats with shrubs. The species is especially associated with forested areas recently altered by logging, forest fires, or wind (Niemi and Pfannmuller 1979; Collins et al. 1982; Niemi and Hanowski 1984). Schulte and Niemi (1998) found the species significantly more abundant in recently logged areas compared with burned areas (Figure 4). The National Forest Bird (NFB) Monitoring Program found the Chestnut-sided Warbler occurred in a wide variety of forest cover types, but it was most abundant in regenerating upland habitats or open, dry, shrubby upland areas in the Chippewa and Superior National Forests (Niemi et al. 2016). However, it also occurred commonly in aspen-birch, jack pine, and red pine forest cover types. It tends to avoid mid- to late-successional upland northern hardwoods, lowland habitats, and many coniferous habitats, especially those that lack a shrubby understory. The MNBBA habitat profile indicated use of a wide variety of habitats, including the following forest types: northern mixed, pine, upland conifer, and lowland conifer. Age is not well represented in this broad habitat analysis, but many of these forest types include young, regenerating forests (Figure 5). Typical breeding habitat of the Chestnut-sided Warbler in Minnesota (© Gerald J. Niemi). Habitat profile for the Chestnut-sided Warbler based on habitats within 200 m of point counts where the species was present during the Minnesota Breeding Bird Atlas (2009-2013). The North American breeding population was estimated at 18 million breeding adults by Partners in Flight (Rosenberg et al. 2016). The MNBBA estimated Minnesota’s population at 6.14 million breeding adults (95% confidence interval ranged from 5.77 to 7.55 million). However, in a previous analysis, Partners in Flight (Partners in Flight Science Committee 2013) estimated 1.5 million adults. The MNBBA data suggests that the Partners in Flight estimates are conservative in Minnesota. The higher MNBBA estimates may result, in part, to the increased coverage of the roadless areas of northern Minnesota that are not sampled by the federal Breeding Bird Survey (BBS), which is used to estimate the populations presented by Partners in Flight. 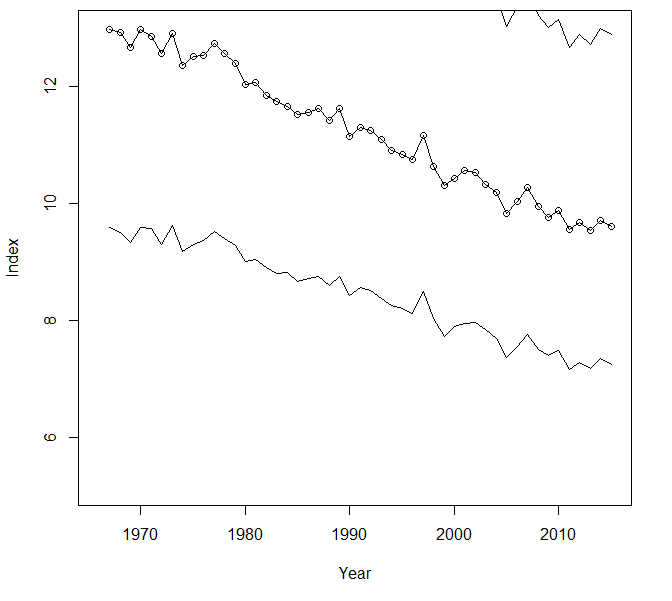 In Minnesota, the BBS indicated a significant decline in the species’ population from 1967 to 2015 of 0.62% per year, which is less than the survey-wide decline of 0.84% per year (Figure 6). Wisconsin and Michigan had stable trends over this same period. Ontario had an even greater significant negative trend of 2.12% per year, but Manitoba recorded a significant positive trend of 1.55% per year. Overall, Partners in Flight (Rosenberg et al. 2016) estimated a 42% decline in the population from 1970 to 2014. Declining populations in North America are primarily found in the southern Appalachians, in the northeastern United States, in southern Michigan, and in the upper Midwest from northeastern Minnesota to central Ontario (Figure 7). NFB trends also indicated an almost significant (p < 0.10) decline of 0.68% per year from 1995 to 2016, which was amazingly similar to the BBS trend in Minnesota. The NFB decline has been especially precipitous over the past 12 years (2004 to 2016) (Figure 8). Mean overall population densities in the Chippewa and Superior National Forests were 14.3 and 16.7 pairs per 40 ha, respectively (Niemi et al. 2016). Within specific forest cover types, densities can vary considerably from 1.8 to 14.5 pairs per 40 ha in mature aspen-birch forests or up to very high densities of over 46 pairs per 40 ha in regenerating forest stands less than 10 years old (Niemi et al. 2016). In regenerating stands, it is often the most common species detected. Breeding population trend for the Chestnut-sided Warbler in Minnesota for 1967–2015 based on the federal Breeding Bird Survey (Sauer et al 2017). Breeding population trend map for the Chestnut-sided Warbler in North America for 1966–2015 based on the federal Breeding Bird Survey (Sauer et al 2017). 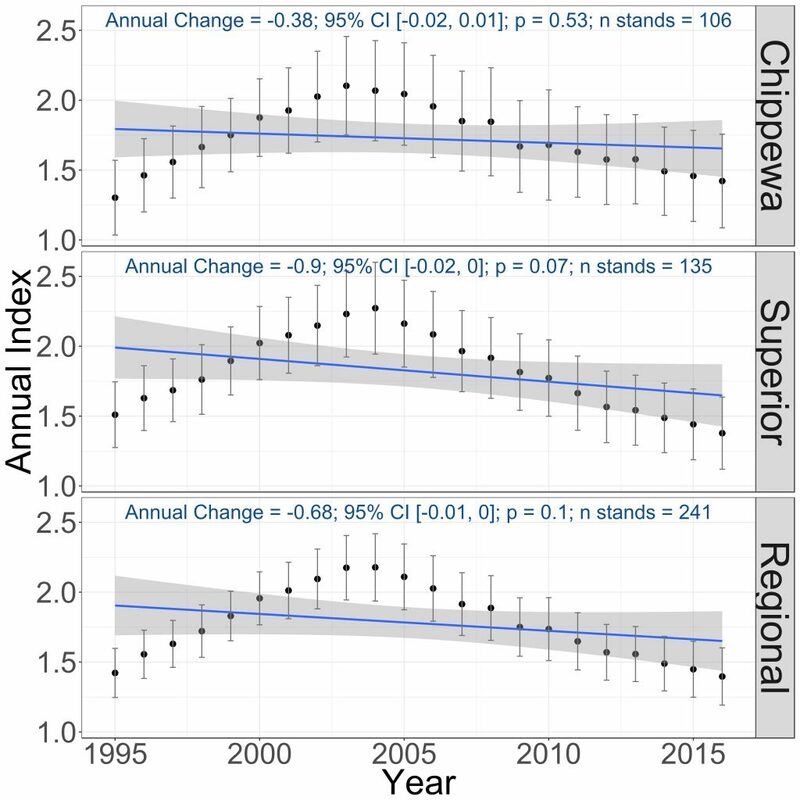 Breeding population trends of the Chestnut-sided Warbler in the Chippewa and Superior National Forests and the combined regional trend, 1995–2016 (Bednar et al. 2016). Partners in Flight estimated a relatively high conservation concern score of 12/20 for the Chestnut-sided Warbler. The score was largely driven by the species’ overall population decline of 42% since 1970. Pfannmuller (2012) identified the species as a Stewardship Species because a high proportion of its population (> 6%) was estimated to occur in Minnesota. A major threat to the species is the loss of young forests due to forest succession and loss of forests in general due to agriculture and human settlements, especially in the southern portions of the species’ breeding range in Minnesota. The Chestnut-sided Warbler responds positively to logging of forests and the subsequent regeneration of early successional shrub habitats (Hobson and Bayne 2000; Chizinski et al. 2011). In Minnesota, the total wood harvest began to decline in 1999 and to decline more steeply since 2005 (Niemi et al. 2016). Zlonis and Niemi (2014), however, observed that the species was equally abundant in managed, logged forests and in wilderness areas without logging, presumably due to the availability of sufficient natural disturbances such as fire and windthrows or natural breaks between different habitat types due to topography or variations in soil conditions. Even though the population is still relatively large, the magnitude of the Chestnut-sided Warbler’s population decline is alarming. Besides habitat loss and changes, several issues may also be affecting the population. For instance, Longcore et al. (2013) identified it as a species for which greater than 1% of the population suffers mortality at communication towers. In addition, Langham et al. (2015) and the National Audubon Society (2015) identified the species as “climate threatened” because of a rapidly dwindling change in its current core breeding range. The BBS (Figure 7) provides evidence that its population is expanding to the northwest, perhaps in response to climate changes in its more southerly breeding areas. Threats on its wintering grounds are largely unknown. It is counterintuitive that the breeding population of the Chestnut-sided Warbler appears to be on the decline throughout many parts of its range, including in Minnesota even though its range may be expanding in the state. It is difficult to imagine its presence was not noted in southern or western Minnesota over the past 100-plus years since its absence was first mentioned by Roberts in the early 1900s. However, as stated above, the songs of the Chestnut-sided Warbler and Yellow Warbler are very similar. It remains a possibility that the Chestnut-sided Warbler has not been detected in the southern portions of its range in Minnesota because of misidentifications as the Yellow Warbler. Among other potential reasons for the Chestnut-sided Warbler’s recent decline may be a combination of reduction in logging activity and maturation of forests, especially in the eastern United States, increased hazards during migration, climate change, overwintering survival, and a host of unknown factors. Like the decline in the Mourning Warbler, causes for the decline of the Chestnut-sided Warbler are worthy of additional study. Chizinski, Christopher J., Anna Peterson, JoAnn M. Hanowski, Charles R. Blinn, Bruce Vondracek, and Gerald J. Niemi. 2011. “Breeding Bird Response to Partially Harvested Riparian Management Zones.” Forest Ecology and Management 261: 1892–1900.